The Doug Rucker School Free Networking and Training event will take place on February 22nd and 23rd at the Courtyard Marriott in Kingwood Texas. Address for the Courtyard Marriott is 130 Northpark Plaza Kingwood Texas and the phone # is 2819731790. When calling to make your room reservations please make sure you mention you are attending the Doug Rucker School event, so that you receive the discounted room rate. Stay tuned to this thread as I will update with more information as I work on making this the best Doug Rucker's School Houston Texas Pressure Washing Event ever. Also please stay tuned to my web site Pressure Cleaning School as updates will be made there first. The event on February 22nd and 23rd is absolutely FREE to attend, but you must register at UAMCC EVENTS in order to attend. I will also have some paid training classes that week that begin on Sunday February 18th. Everett Abrams and I will be hosting and conducting a wood restoration school Sunday February 18th, at 9:00am and will end at Noon on February 20th. This 2 and 1/2 day school will teach you everything you need to know about Wood Restoration as we completely restore a wood house and the deck's attached to it. As many of may know that have attended my monthly school here in Houston, my home is all Wood and also has a couple stair cases, wood decks, and other wood surfaces. All surfaces will be stripped, prepped and then stained, and you'll have the opportunity to learn how all this is done from the Wizard of Wood himself Everett Abrams. Cost for this school is $950.00 and is limited to the first 20 participants that register and pay. You can register and pay at my web site by clicking HERE. If you've ever thought about adding Wood Restoration to your existing business, or are thinking about starting a wood restoration business, this school, taught by one of the finest Instructors in the country, will help you achieve your goal. Please feel free to call or text me at 2818833630 if you have any questions. On February 21st, I will be hosting another paid training school. The Pressure Washing Soft Washing Training Event will teach you how to clean commercial properties as well as how to get and sell these types of clients. The morning session, Ron Musgraves and myself will teach you, in the filed and hands on, how to clean a variety of surfaces such as a multi story hotel using a lift, entry area to a hotel, and the pool deck. We will also cover sidewalk cleaning, dumpster pad cleaning, and gas station cleaning as well. The afternoon session will consist of class room training covering commercial sales to Property Managers, Fast Food Restaurants, Getting on Vendor Lists, and much more. Cost for this school is $129.00, and you must be paid and registered prior to January 15th to avoid the price increase for late registrations. To register and pay please go to Pressure Washing Soft Washing Training Camp. If your from the Houston Texas area then you know this guy in the picture with me. 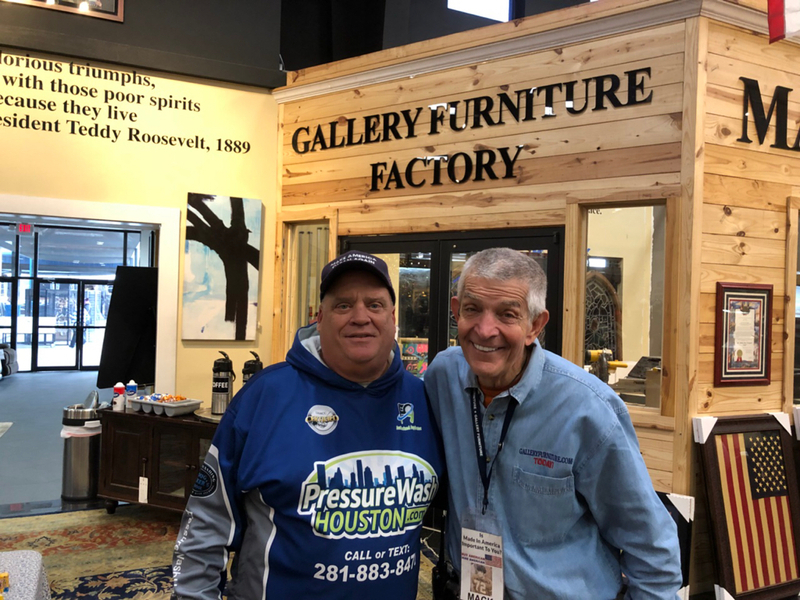 Jim “Mattress Mack” McIngvale of Gallery Furniture will be one of the keynote speakers.